Most people don’t realize that cooking is like kissing: doing it a little usually leads to doing it a lot more. Just the other day I started making a peach and blueberry crisp (yes, another one – quit looking at me like that!) and lo and behold, while it was in the oven I prepped these tomatoes. They went into the oven after the crisp was done so that we could have a yummy, fresh pasta sauce for dinner. After all, if the kitchen is already going to need to be tidied, why not make it worth your while? Combine some seeded tomatoes and a chiffonade of basil in a bowl. Toss with good quality balsamic vinegar, minced garlic and salt and pepper to taste. Drizzle generously with extra virgin olive oil and spread on a baking sheet. Roast the tomatoes in a 300°F (150°C) oven for 30 to 40 minutes or until the tomatoes are softened and the pan is getting brown. Deglaze the pan with a few tablespoons of dry sherry and smush up the tomatoes with the edge of a spoon. Spoon the sauce over hot, lightly oiled pappardelle and garnish with shreds of Parmesan or asiago cheese. Or, do what I did last night and top each bowl with a disc of bocconcini cheese and lots of cracked pepper. This salad was the result of a panic attack: I looked at the counter and realized that I had way too many ripe peaches and tomatoes. The solution? Transform them into something fast! I can’t seem to resist over-buying when I’m in the produce aisle at this time of year – everything looks so fantastic; it’s local; it’s good value and I just want it all! The downside to buying peaches and tomatoes by the basket instead of two or three at a time when you’re a family of three is that you have to eat a lot of produce quickly to avoid the guilt of wasting the best fruit you’ll taste all year long. Blanch and peel the peaches. Cut them into wedges and toss with enough good quality balsamic vinegar to coat all over. Slice the tomato into wedges and add it to the bowl. Thinly slice the basil leaves and sprinkle over the fruit. Season with salt and pepper and drizzle with olive oil. Toss gently. Taste and add more vinegar, oil, salt or pepper as needed. Toss with the lettuce and serve immediately. 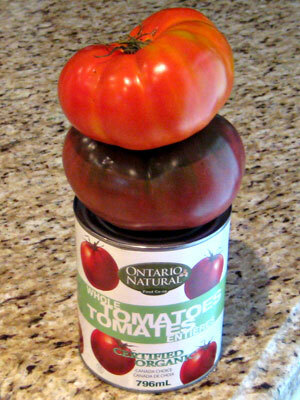 This picture shows one of my rescued, window sill-ripened Brandywine tomatoes perched on a rescued Cherokee Purple tomato that itself is perched upon a can of organic Ontario tomatoes. This pic was taken a couple of weeks ago but I saved it for today. At this point, most of my readers (at least the ones in Canada) will have very little produce to harvest from their gardens. A cabbage remains here and there; a few carrots or beets, tops blackened by frost might still be salvageable; and, maybe a few of you in the warmer parts of Ontario like Pelee Island or in BC on Vancouver Island have some Brussels sprouts waiting for a good frost. For the rest of us, it’s back to the produce section where many of the options are trucked in from warmer climes. While I will buy lettuce and other produce from around the globe during the colder months, I was heartened to see this can of tomatoes at Planet Organic. It’s nice to know that even if the growing season is over, that good quality local produce solutions can still be found if you look for them. Will you try to buy products like these tomatoes now that the colder weather has arrived? Or will you put your locavore practices aside until spring? When I heard this morning that our temperature had dipped to a lowly 8 degrees celsius last night I had a bit of a panic attack. My heirloom tomato plants (brandywines, cherokee purples) and my two big boy tomato plants have produced a plentiful but late-to-ripen crop. So, today I staged a tomato rescue. I’ve spread this bounty out now on parchment-lined baking sheets to ripen. I’ll report back to you about whether these potentially delicious orbs ripen or atrophy. Keep your fingers crossed! Occasionally, we all need a little help to stand straight (especially after tequila!) and it turns out tomatoes are just like us. I’ve learned a lot with my big gardening adventure experiment. 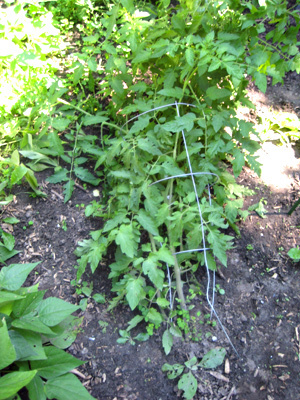 One of my recent lessons is that tomato cages aren’t strong enough to support a healthy tomato plant. Stakes, I’ve learned, are the way to go. When I planted my tomato seedlings in late May they were less than 6 inches tall and the cages I found at the local garden centre seemed more than adequate support for the mature plants I envisioned they would grow into; however, as you can see above, I was wrong. So very, very wrong. This picture was taken right after I got home from holiday two weeks ago. While I was away in the Yukon, my poor tomato plants had fallen and couldn’t get up! It’s so hard for me to believe that in April these bushes, now waist high and laden with heavy fruit, were but mere tomato seeds. Their growth is really astonishing! I made an emergency run to the garden centre and picked up some lightweight but stiff metal stakes and some stretchy garden tape. After working the stakes into the soil near where the plants are rooted, I carefully untangled the arms of each plant and did my best to tether them to the stakes. So far my bindings are holding and within the next day or so I’ll be eating tomatoes! All three of these varieties are supposed to mature within 70 to 75 days so if all goes well, I should have a pretty abundant crop of colourful tomatoes to share by the end of July (the line up starts from the left!). In the past I’ve written that you should start tomato seedlings indoors no more than 6 weeks prior to transplanting the tomato plants to the garden, but I started mine earlier this year due to the crazy extended winter weather. The general concern with starting seeds too soon is that the young plants can become leggy and weak. To prevent that problem, I’m going to transplant my seedlings into larger pots in enough peat moss to help support the bases. We’ll see how it goes. In the meantime, here are my tips for successfully transplanting and growing tomato seedlings. Print this page or bookmark it so that you can come back to this info later in the spring and summer when you need it. 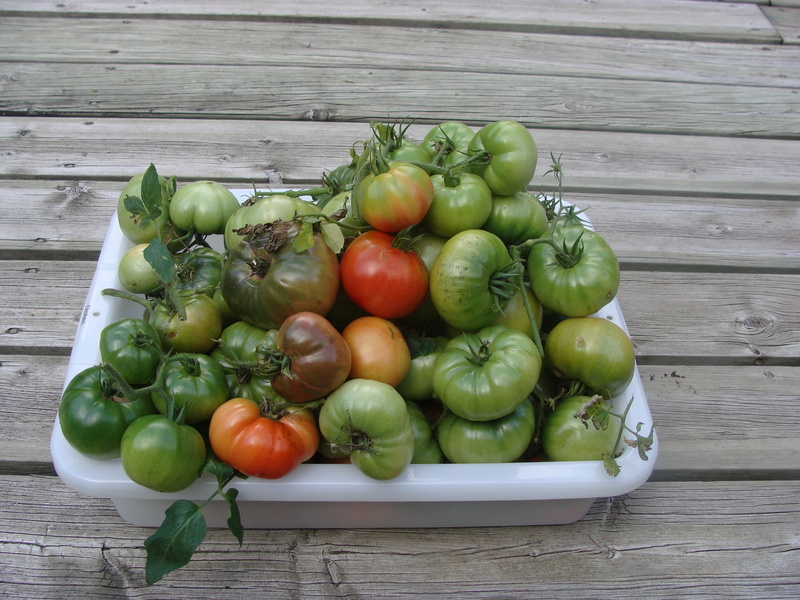 • Before planting tomato seedlings, work a spadeful of compost into each hole. This should be enough fertilizer to feed the plant for the entire season. • To help new tomato plants to establish themselves in cool spring temperatures, protect the seedlings by cutting the bases from 2L soda bottles. 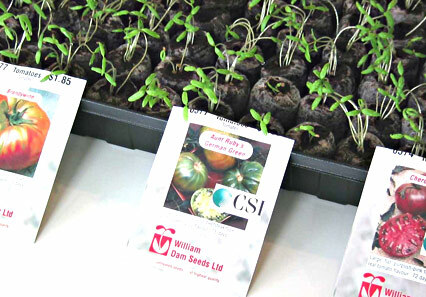 Place a bottle over each seedling until temperatures become warmer. • Since hot summer weather can lead to dry soil conditions, be prepared to water tomatoes often during hot spells. Ideally the water used to water tomato plants should be ambient temperature (this is where my rain barrel will come in handy!) since cold water may prevent the roots from developing. Likewise, it’s better to water tomatoes at the base of the stem with a watering can than to use a hose that drenches the whole plant. • When mature, tomatoes ripen to optimum flavor when grown at temperatures between 13°C and 27°C. As a result, tomatoes must be planted so that the fruit will mature when this temperature range is common in your area. Just before Easter my father and I had an interesting conversation about an annual contest he and his friend Marshall have to see who can grow the most delicious tomatoes. When I asked my Dad (who was raised on a farm) to share his tomato tips with me, I discovered that although I’m a relative city slicker, I’m a much ‘greener’ gardener than my dad. While I’m starting three kinds of heritage tomato seeds on the window sill and intend to pamper my plants with non-toxic organic matter and kill any nasty leaf munching bugs with soap and water, my dad will buy his plant at Walmart or Home Depot and douse it regularly with commercial fertilizer and clouds of tomato dust bug killer. I’ve eaten the sandwiches made with his tomatoes in previous years so I know his method will create a great tomato. What I don’t know is if mine will be better. So, I’m going to invite myself to his tomato contest this year to see if my experiment results in more than just added peace of mind (or is it piece of mind? I’ve always been confused by that saying). • I like the seed starter kits pictured above. They’re easy to use, lightweight and tidy. I bought my seed starter trays at the hardware store but you can order them from places such as Lee Valley as well. • It’s never been easier to find heritage seeds. I saw some at the grocery store the other day and found even more in the garden section at the hardware store. However, I did order seeds for some specific items from an online seed catalogue. I found my supplier through Seeds of Diversity but a quick online search can point you in the right direction as well. • This year the tricky part about starting seeds is anticipating when to take the plunge. My strategy has been to delay starting seeds for two weeks longer than usual to compensate for the crazy cold weather. (I can’t imagine I’ll be planting anything outdoors before late May this year). • I’m also starting the plants that have a long maturation such as corn and pumpkins in pots. I’m hoping that by planting these items outdoors as plants instead of seeds that I’ll have some hope of a harvest before the fall frost comes. • I label each row of seeds clearly. It’s important so that you can tell exactly what each plant is later on when it comes time to choose an appropriate place for it in the garden. • In past years I found that the cells in these starters can be too wet to germinate seeds without growing mold. So, I recommend soaking them and then letting the cells stand for 12 hours before adding seeds. Later, water them often but sparingly (a spray bottle is ideal) so that you don’t wash away the seeds before they can drop roots.